Butter the bottoms and sides (get into the corners, too!) of a 9X9-inch square baking pan. Set aside. Place the vanilla bean and scraped seeds in a saucepan and pour in the heavy cream. Heat the mixture over medium heat until steaming. 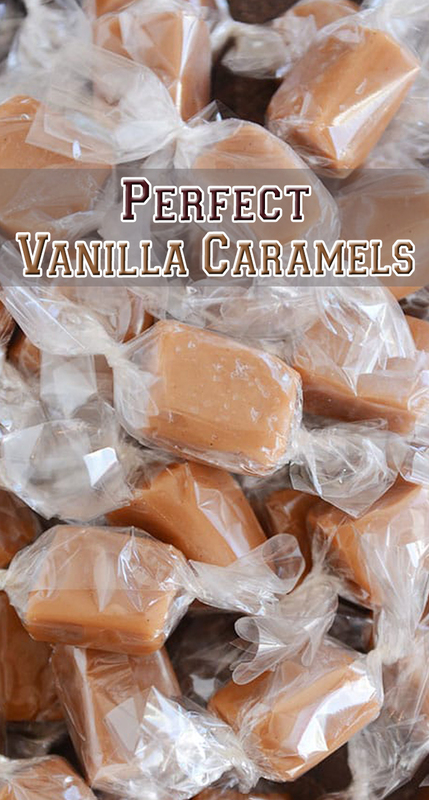 Remove from heat, cover and let sit (for at least 20 minutes) - go ahead and start making the caramels while the vanilla cream steeps. For the caramels, in a large, heavy-bottomed pot (at least 5- or 6-quarts), stir together the sugar, corn syrup, and water, taking care to not splash the mixture up the sides of the pot. Clip a candy thermometer onto the side of the pan. Bring the mixture to a boil over medium-high heat WITHOUT STIRRING or moving the pan. Right as it starts to boil, fill a cup with water and use a pastry brush to wash down the sides of the pan so there are no granules of sugar sticking to the sides of the pan (you probably won't need to repeat this after the sides have been well-cleaned). The sugar mixture will bubble and start to darken. If you haven't already, take the vanilla bean pod out of the cream mixture so it's ready to go once you need it. Cook until the mixture registers 325 degrees F on the thermometer, about 25-30 minutes (for darker but still chewy caramels, continue cooking the sugar mixture - I've gone as high as 345 for super intense, dark caramels; beware the next step will cause much more steaming and bubbling the higher you cook this initial sugar mixture). Slowly and carefully pour the steeped vanilla cream mixture into the caramel - it will bubble and produce a lot of steam! Add the butter and salt. The mixture will have expanded during this step but will "fall" back to a lower level as the temperature lowers due to the added ingredients. Stir the caramel with a clean heatproof spoon or spatula (if it's the one you used in the 3rd step, be sure to wash it to avoid introducing sugar granules to the caramel), avoiding scraping the edges of the pan, and continue to cook, stirring constantly and slowly, until the mixture reaches 245 degrees F, about 10-15 minutes (you can go as high as 248 degrees F for a firmer, but still chewy, caramel, and even take it off earlier for a softer caramel; 245 is perfect in my book). Immediately pour the caramel mixture into the prepared pan. Let the caramels cool completely. Sprinkle with fleur de sel, if desired. I use a large, metal spatula to peel the whole slab of caramel out of the pan and onto a cutting board. Cut into squares using a sharp knife or bench scraper, wrap, and store in an airtight container for up to two weeks.